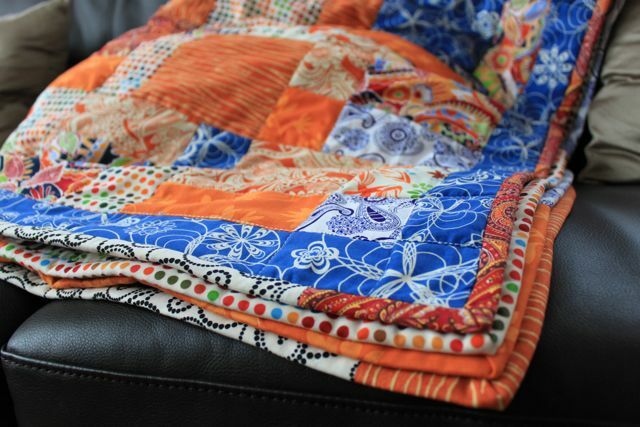 This is the first quilt I ever made, of course there is lots of orange in it. I followed Care from Obsessively Stitching First Quilt Ever tutorial. It was so fun and easy to follow, I can't say enough great things about it. Look at how tiny PB is here, he can't even walk yet. This was taken last May. My favorite part of the quilt is the binding. I loved the instructions Care had and I love that it is pieced together. I had so much fun making this quilt. PB loves it too. It is snowing big fat flakes here. I could go for some spring weather right about now! ooooh Kris it is gorgeous!!!!! You're a sewing machine! 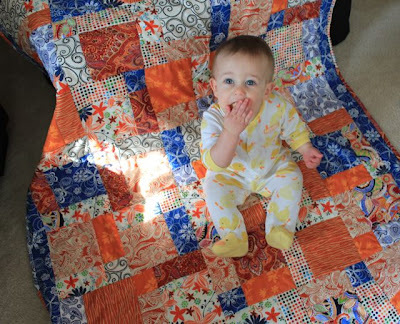 I can't believe that is your first quilt. It is beautiful! I think that quilt is gorgeous. your first quilt?! for real?! amazing!! !